Adjuvant therapy for breast cancer is designed to treat micrometastatic disease, or breast cancer cells that have escaped the breast and regional lymph nodes but have not yet established an identifiable metastasis. 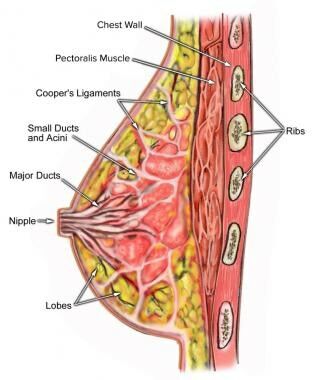 The image below depicts the anatomy of the breast. Combination chemotherapy regimens are standard recommendations in the adjuvant setting. Major Cancer and Leukemia Group B (CALGB) chemotherapy clinical trials have consistently shown that chemotherapy produces significantly better disease-free and overall survival, particularly in patients with ER-negative disease. The best candidates for neoadjuvant chemotherapy are patients with ER-negative and/or HER2-positive expressing tumors whose pathologically complete response (pCR) rates can approach 65% and predict long-term survival. Patients with ER-positive, HER2-negative locally advanced breast cancer (LABC) are unlikely to achieve a pCR from currently available chemotherapy. For more information, see Breast Cancer, HER2 Breast Cancer, and Breast Cancer Treatment Protocols. Adjuvant treatment of breast cancer is designed to treat micrometastatic disease, or breast cancer cells that have escaped the breast and regional lymph nodes but have not yet had an established identifiable metastasis. Depending on the model of risk reduction, adjuvant therapy has been estimated to be responsible for 35-72% of the reduction in mortality rate. For patients with node-negative Her2Neu-positive cancer (defined as 3+ on immunohistochemistry a ratio of ≥ 2.0 on fluorescent in situ hybridization [FISH] testing, or a Her2 copy number ≥ 6) with tumors > 1 cm, trastuzumab should be offered for 12 months. It can also be considered in patients with tumors ≤ 1 cm. When given in this setting, trastuzumab should be given concurrently with non-anthracycline chemotherapy. Combination chemotherapy regimens are standard recommendations in the adjuvant setting. The most commonly used regimens are shown in Table 1 below. A comparison of the inferior-dose arm of C8541 with the dose-dense arm of C9741 demonstrated a remarkable 63% improvement in disease-free survival and a 59% improvement in overall survival in patients with ER-negative disease, compared with 32% improvement in disease-free survival and 18% improvement in overall survival in patients with ER-positive disease. Overall, the advantages of chemotherapy, particularly in ER-negative disease, were observed across all three trials, irrespective of the chemotherapy regimen used. The randomized, prospective Phase III CALGB 9741 study assigned 2005 subjects to one of 4 arms: convention AC x 4 cycles -> T x 4 cycles (all q 3weeks) vs AC x 4 cycles --> T x 4cycles (all q 2 weeks), vs A x 4 cycles -> T x 4 cycles -> C x 4 cycles (all q 3 weeks), vs A x 4 cycles -> T x 4 cycles -> C x 4 cycles (all q 2 weeks). Dosing was the same in all arms, and the dose dense groups received peg-filgrastim suppourt on day 2 of each 14 day cycle. The 4 year DFS for the dose dense groups was 82% and 75% for the other two. Subsequent trials have failed to replicate the same results of this pivotal trial, so the dose dense schedule has not emerged as the standard of the care. Taxanes are among the most active and commonly used chemotherapeutic agents for the treatment of early-stage breast cancer. However, questions have lingered as to whether taxanes are the most effective chemotherapeutic agent to use in this setting and, if so, which is the best dosing schedule. Although they are gernally better tolerated than the anthracyclines, they can have considerable toxicity: peripheral neuropathy, myelosuppression, myalgias, and the risk of infusions reactions. However, the National Cancer Institute of Canada MA.21  and UK TACT trials,  which used taxane- and nontaxane-based chemotherapeutic regimens in early-stage breast cancer patients, did not demonstrate a benefit in using taxanes. Although the precise role of adjuvant taxane therapy remains controversial, the optimal scheduling of taxane administration has been determined. Thus, taxane-based regimens still have use in the treatment of early-stage breast cancer and should be considered in treating women, especially those with HER2-positive disease, using either the weekly paclitaxel or every-3-week docetaxel dosing schedules. Anthracycline-containing adjuvant chemotherapy regimens have been used in the treatment of early-stage breast cancer for decades, although concerns regarding anthracycline-associated cardiotoxicity or leukemogenic potential remain. In the 2000 Early Breast Cancer Trialists' Collaborative Group (EBCTCG) overview, anthracycline-based regimens were associated with an annual risk of cardiac mortality of 0.08% per year, as compared with 0.06% per year in patients treated with nonanthracycline-based regimens. However, the question of long-term cardiac safety remains, particularly for older women with early-stage breast cancer. The US Oncology 9735 trial established TC (docetaxel/cyclophosphamide) as a viable option for treating women with early-stage breast cancer, especially those at high risk of cardiotoxicity or requiring only 12 weeks of therapy. This study randomized 1016 women with operable breast cancer (stages I-III) to 4 cycles of TC versus 4 cycles of standard dose AC (Adriamycin/cyclophosphamide). Biologically, anthracyclines inhibit topoisomerase IIa, whose gene (TOP2A) lies adjacent to the HER2 gene on chromosome 17. TOP2A is co-amplified in approximately 35% of HER2-overexpressing breast cancers. This group comprises only approximately 8% of the total breast cancer population and may be the only subgroup to benefit from anthracycline administration. The role of TOP2A as a predictive marker of response to anthracyclines needs further validation. Until then, patients should not be deprived of anthracycline-based adjuvant chemotherapy if their risk assessment so determines it. However, final analysis of the BCIRG-006 trial confirmed the increased toxicity of anthracyclines and called their therapeutic value into question. The 10-year disease-free survival was 74.6% with AC-TH versus 73.0% with TCH, and overall survival at 10 years was 85.9% and 83.3%, respectively, but neither difference reached statistical significance. An anthracycline followed by or concurrent with a taxane is the optimal therapy for "triple-negative" breast cancer patients with no medical contraindications. However, it remains unclear what the optimal combination chemotherapy regimen is for ER-positive, HER2-negative tumors. Currently, CMF, TC, or an anthracycline-based regimen may all be reasonable options. In estrogen receptor (ER)–positive early-stage breast cancer, hormone therapy plays a main role in adjuvant treatment, either alone or in combination with chemotherapy. Hormone treatments function to decrease estrogen's ability to stimulate existing micrometastases or dormant cancer cells. Adjuvant hormone therapy can reduce the relative risk of distant, ipsilateral, and contralateral breast cancer recurrence by up to 50% in tumors with high ER expression. FDA-approved endocrine therapies for adjuvant treatment of breast cancer include tamoxifen and the aromatase inhibitors (anastrozole, letrozole [Estroblock], exemestane [Aromasin]  ). Tamoxifen is a selective estrogen receptor modulator (SERM) that binds to and inhibits estrogen receptor signaling in the breast. As a receptor antagonist, it is effective in both premenopausal and postmenopausal women. Tamoxifen has ER-stimulating effects in other tissues, which has both beneficial and adverse consequences: in bone, the stimulation results in preservation of bone density; in endometrium, it leads to a 2- to 4-fold increased risk of endometrial cancer. A pilot study by Nielsen et al found that ESR1 amplification is associated with a poorer outcome following adjuvant treatment with tamoxifen among patients with ER-positive early breast cancer. However, the prognostic and predictive impact of ESR1 copy number changes requires further study, and such testing is not considered standard of care. Tamoxifen has been approved for breast cancer treatment since the early 1980s and has been shown in multiple studies to decrease breast cancer–associated mortality and recurrence. In an analysis of 55 trials evaluating tamoxifen versus placebo in the adjuvant treatment of breast cancer, 5 years of tamoxifen therapy resulted in a 47% reduction in recurrence and a 22% reduction in mortality. Although many patients attribute postdiagnosis weight gain to tamoxifen, the literature suggests only a 5% increase in weight is associated with tamoxifen use. Tamoxifen is a prodrug that is metabolized primarily by the cytochrome P450 (CYP2D6) system to its active metabolite, endoxifen. More than 80 different alleles of the CYP2D6 gene have been identified, with varying activity levels. Consequently, patients can be categorized by their level of CYP2D6 activity into high/extensive or low/poor metabolizers. Some laboratories now offer CYP2D6 testing for patients treated with tamoxifen, but this testing is still controversial. For more information on tamoxifen metabolism, see Tamoxifen Metabolism and CYP2D6. Up to 7% of the white and black populations are poor metabolizers of tamoxifen. Poor metabolizers have been shown in several retrospective studies to have lower disease-free survival and higher recurrence rates than extensive metabolizers. Poor metabolizers also seem to tolerate tamoxifen better, with less severe hot flashes and endocrine-related toxicities. More recently, Donneyong et al found no increase in all-cause mortality in patients taking tamoxifen and potent CYP2D6-inhibiting SSRIs compared with patients taking tamoxifen and other SSRIs. These authors reviewed data from five US databases on 14,532 women who were prescribed an SSRI either before or during their tamoxifen treatment; of those, 5,799 were prescribed paroxetine or fluoxetine, while the remainder received the weak CYP2D6 inhibitors citalopram, escitalopram, fluvoxamine, or sertraline. Although the study sample was large, the study period was only 2 years, which many experts feel is too short to permit definitive conclusions. Consequently, until longer-term followup data become available, the use of potent CYP2D6 inhibitors should be avoided if possible in patients on tamoxifen. Other strong inhibitors of CYP2D6 include quinidine, risperidone, and tenofovir. Aromatase inhibitors (AIs) function by inhibiting aromatase, the enzyme (found in body fat, adrenal glands, and breast tissue, as well as tumor cells) responsible for converting other steroid hormones into estrogen. Aromatase is the sole source of estrogen in postmenopausal women and likely the underlying reason that obesity (larger volume of body fat produces more estrogen) has been associated with a higher risk of breast cancer in postmenopausal patients. As the AIs have no effect on ovarian estrogen production, these agents are effective only in postmenopausal women. Common side effects of AIs include hot flashes (12-36%), arthralgia/arthritis (17%), headache (9-13%), vaginal dryness (2%), and mood changes (19%). Significant benefit was also seen in time-to-recurrence of contralateral breast cancer. However, none of the head-to-head comparison trials has yielded an improvement in overall survival compared with tamoxifen. Early switching trials in which AIs are initiated after 2-3 years of tamoxifen have also shown improved disease-free survival. However, in contrast to the upfront trials, an improved overall survival is observed when ER-negative patients are excluded and randomization occurs at the time of switching. The Canadian-led MA.17 trial randomized patients to an additional 5 years of AI therapy with letrozole after completion of 5 years of tamoxifen therapy and resulted in improved disease-free survival in all patients randomized, as well as improved overall survival in the higher-risk lymph node–positive subset of patients. This study was the first to suggest that prolonged hormone therapy may be more effective than 5 years of therapy. The optimal duration and sequence for the use of AIs has not been defined clearly, but their benefits in terms of breast cancer recurrence and survival clearly support their use in all postmenopausal women. Ongoing trials are now comparing 5 and 10 years of AI therapy, including a continuation of the MA.17 trial, which will include patients receiving hormone therapies for up to 15 years, and evaluation of whether the sequence of hormone agent (ie, tamoxifen followed by AI vs AI followed by tamoxifen) affects efficacy. The BIG 1-98 Collaborative Group found that disease-free survival was not significantly better between 2 sequential treatment groups with letrozole and letrozole monotherapy and that overall survival was not statistically different between monotherapy with letrozole and monotherapy with tamoxifen (when combined with previous trial data comparing efficacy in 4922 postmenopausal patients with endocrine-responsive breast cancer for letrozole). In this randomized, double-blind, phase III trial to evaluate the optimal treatment strategy, 6182 patients were randomly assigned to the following treatment groups: 5 years of tamoxifen; 5 years of letrozole; letrozole for 2 years followed by tamoxifen for 3 years; and tamoxifen for 2 years followed by letrozole for 3 years. Most programs of neoadjuvant therapy used in the United States have been anthracycline-based, with FAC (doxorubicin [Adriamycin] in combination with fluorouracil and cyclophosphamide) as the best historical reference. In inflammatory breast cancer (IBC), the early program of 4 cycles of FAC, then surgery followed by an additional 4 cycles of FAC, then irradiation, led to a median survival of about 2 years and 5-year survival of about 30% of patients, which are dramatic improvements over historical outcome with local therapy alone (5-year survival of < 5%). About 15% of initially node-positive patients who achieve pCR in the breast have residual disease in the axilla. Patients who have no residual disease in both the primary site (pCR) and lymph nodes (N0) have the best overall prognosis, with a markedly prolonged disease-free survival. To date, no cooperative group trial has attempted to improve upon the results of neoadjuvant chemotherapy, given as induction, with administration of alternative treatment after surgery when the surgical result was suboptimal. A final important observation made by the MD Anderson group, from a randomized design, was that 12 cycles of weekly docetaxel followed by FAC was superior to paclitaxel given every 3 weeks for 4 cycles, followed by the same FAC program, resulting in a doubling of the pCR rate for locally advanced breast cancer from 14% to 28%. The pCR in this trial was defined as disappearance of microscopic evidence of all invasive disease at both the primary site and the axilla, whereas much of the other literature (including trials done by the NSABP) reports on pCR at the primary site only. About 15% of initially node-positive patients who achieve pCR in the breast have residual disease in the axilla. Both criteria, however, predict for markedly superior long-term disease-free survival, with the pCR N0 criterion having the best outcome. The Southwest Oncology Group (SWOG) confirmed the results of several other neoadjuvant trials in that ER-negative tumors have a higher pCR compared with ER-positive tumors and that infiltrating ductal histologies have a higher pCR rate compared with infiltrating lobular histologies. The investigators reported the preliminary results of their prospective, randomized trial in which "standard" AC, given every 3 weeks at standard doses, was compared with a schedule of continuous chemotherapy with the same agents (weekly Adriamycin [A], daily oral cyclophosphamide [C] [Cytoxan]) in patients with locally advanced breast cancer (LABC) or inflammatory breast cancer (IBC). The continuous or "metronomic" schedule required administration of granulocyte colony-stimulating factor (GCSF) as growth factor support. All patients on the trial, after completing AC, went on to receive weekly paclitaxel. The pCR rate was higher on the "continuous" arm, and this effect was most marked in patients with IBC, as well as triple negative (ER-negative, PR-negative, HER2-negative) patients with LABC. For patients with HER2 overexpression, the value of adding trastuzumab in the adjuvant setting led to its incorporation into neoadjuvant therapies for patients with the HER2-positive phenotype. This results in higher rates of pCR for operable patients—as high as 65% initially reported by the MD Anderson group—when trastuzumab was given concurrently with an epirubicin (Ellence)-containing program. One preliminary report from a randomized trial in Europe indicates an improvement in pCR rate from 13% to 48% when trastuzumab was added to standard neoadjuvant chemotherapy. Approval was based on a randomized trial that compared a number of regimens with and without pertuzumab in women with HER2-positive breast cancer. In the trial, 39.3% of patients treated with pertuzumab, trastuzumab, and docetaxel (n = 107) achieved a pathologic complete response (pCR) compared with 21.5% of patients treated with trastuzumab and docetaxel (n = 107) at the time of surgery. A confirmatory trial will provide long-term outcomes and is expected to be completed in 2016. CALGB 40603 was a 2x2 randomized open-label neoadjuvant study evaluating the addition of bevacizumab and/or carboplatin to a weekly paclitaxel followed by dose-dense doxorubicin and cyclophosphamide (ddAC). The pCR rate was higher in the bevacizumab-treated subjects, although not at statistical significance. Furthermore, the toxicity of the bevacizumab-containing arms, including hypertension, febrile neuropenia, and postoperative complications has led the authors to speculate that bevacizumab has no role in early stage breast cancer. The best candidates for neoadjuvant chemotherapy are ER-negative or HER2-positive expressing tumors in which pCR rates are generally above 20% and predict long-term survival. Patients with ER-positive, HER2-negative LABC are unlikely to achieve a pCR from currently available chemotherapy, and the best approach for these patients is likely to involve building on a backbone of hormone therapy, either alone or in combination with targeted agents. There has been little experience in the United States with neoadjuvant hormone therapy, although this approach has been tested in several clinical trials in Europe. Neoadjuvant hormone therapies appear to be very effective in shrinking tumor size to enable breast-conserving surgery, but pCR is rare. A study by Fitzal et al determined that breast conserving therapy is oncologically safe after tumor downsizing via neoadjuvant chemotherapy in patients primarily scheduled for mastectomy. However, the authors of that study advise that patients should not receive breast conserving therapy without a demonstrated response after neoadjuvant therapy. The NSABP B-18 trial found no significant difference in overall survival or disease-free survival between patients with operable breast cancer randomized to neoadjuvant chemotherapy and patients treated with surgery first and then followed by chemotherapy. However, survival advantage was significant for the 36% of patients who experienced a pCR. Given the notorious propensity of IBC for locoregional as well as systemic recurrence, patients with this disease are nearly always best served by having mastectomy as their definitive surgery. The molecular era in cancer therapy has flourished and our knowledge of cancer biology has expanded. As increased numbers of targeted therapies show promise for the treatment of breast cancer, the goal is to optimize these expensive and toxic therapies with existing anticancer approaches. Small-molecule vascular endothelial cell growth factor receptor (VEGFR) tyrosine kinase inhibitors (TKIs) offer several potential advantages over antibody therapies, including oral administration, a shorter half-life, and multitargeted effects. Sunitinib has also demonstrated activity in combination with paclitaxel (ORR = 33%) and sequentially with docetaxel (ORR = 72%) as first-line therapy in metastatic breast cancer. Axitinib, another oral TKI of VEGFR, showed promising antitumor activity in combination with docetaxel in a randomized phase II trial of first-line chemotherapy in 168 patients with locally recurrent/metastatic breast cancer. The ORR was 40% in the axitinib/docetaxel arm, versus 23% in the docetaxel-alone arm, similar to the results from E2100. The most common adverse events included diarrhea (60%), nausea (53%), fatigue (49%), and stomatitis (44%), with an increase in febrile neutropenia with the combination arm (16%). Other VEGFR TKIs such as pazopanib, vatalanib, cediranib, and motesanib are under investigation. HER2-targeted therapies have been investigated in combination with angiogenesis inhibitors, with promising results. HER2 overexpression is associated with an increase in VEGF levels in primary breast cancers. Combination therapy targeting HER2, EGFR, and VEGF pathways produces greater inhibition of human breast cancer cell lines than inhibition of any single or dual pathway. The angiogenesis inhibitor pazopanib showed promise in a randomized phase II study in combination with lapatinib versus lapatinib alone in chemotherapy-naive, HER2-positive metastatic breast cancer. A 45% response rate was observed in the combination arm, compared with 28% in the lapatinib-alone arm at 12 weeks. Adverse events included diarrhea, rash, nausea, and elevated liver function tests, with only 5% experiencing cardiac toxicity in the combination arm. Additional trials of lapatinib in combination with endocrine therapy or other targeted agents are ongoing. Among signaling pathways, the PI3K/Akt/mTor pathway is thought to be highly active in human breast cancer development and progression. In breast cancer, this pathway can be activated through PI3K by membrane protein receptors, including the HER family of growth factor receptors, IGF-1R and ER. PI3K activates downstream Akt, leading to mTor phosphorylation and promotion of breast cancer cell survival, as well as resistance to chemotherapy and targeted agents such as trastuzumab and tamoxifen. Constitutively active mutations of PI3K have been described in up to 40% of primary breast cancer tumors, implicating a role for PI3K in breast cancer tumorigenesis. SF1126 is a chemical conjugate of LY294002, the most studied of the PI3K inhibitors. This compound has a broad spectrum of inhibition via Akt and mTor resulting in antitumor and antiangiogenic activity. The water-soluble SF1126 has a good pharmacokinetic profile and is well tolerated in murine systems. Phase I trials are ongoing with this compound and other novel PI3K inhibitors. In preclinical breast cancer models, mTor inhibitors substantially inhibit tumor growth. In 109 patients with heavily pretreated locally advanced or metastatic breast cancer, single-agent activity of the mTor inhibitor, temsirolimus (Torisel), yielded an overall response rate of 9%, consisting of 10 partial responses. Based on preclinical data showing a synergistic effect between mTor inhibitors and endocrine therapy, clinical trials have focused on combination therapy. Initial randomized trials investigating letrozole alone or in combination with temsirolimus showed no significant clinical benefit in locally advanced/metastatic breast cancer. In a study by Baselga et al, the addition of the selective mTor inhibitor everolimus (10 mg/d) significantly increased letrozole (2.5 mg/d) efficacy (antiproliferative response defined by reduction of Ki67 expression) as compared with letrozole and placebo. The study included 270 postmenopausal women with operable ER-positive breast cancer. Biopsies were obtained at baseline and after 2 weeks of treatment. The Ras oncogene family is a key component of the MAPK signaling pathway, which promotes mitogenic activity. Aberrant Ras expression resulting in downstream signaling has been reported in breast cancer, although Ras mutations are rare in this malignancy. Farnesyltransferase inhibitors (FTIs) such as tipifarnib and lonafarnib were developed to block farnesylation and subsequent membrane localization of Ras. Early clinical data suggested that FTIs may modulate endocrine response. However, a phase II randomized clinical trial of letrozole with or without tipifarnib in advanced breast cancer failed to meet its primary endpoint. In contrast, a phase II trial showed an overall clinical benefit of 24% in ER-negative or hormone-refractory breast cancer patients treated with tipifarnib, sparking renewed interest in these agents. HER2-positive tumors derived the most clinical benefit from the addition of FTIs, suggesting that HER2 is upstream of Ras. Dasatinib (Sprycel) is a novel oral kinase inhibitor that targets the Src family kinases and BCR-abl. Dasatinib is approved by the FDA for the treatment of chronic myelogenous leukemia (CML). A preclinical study revealed a dasatinib-sensitive signature in the basal breast cancer subtype. Additionally, preliminary results from a phase I study of gemcitabine/dasatinib demonstrated antitumor activity in a patient with IBC. Phase I and II clinical studies of dasatinib as a single agent or in combination with capecitabine in various breast cancer subtypes are under way. Studies of the combination of dasatinib and AIs are also under way in hormone receptor–positive metastatic breast cancer. Poly(adenosine diphosphate [ADP] – ribose) polymerase (PARP) inhibitors were initially developed to investigate the role of PARP-1, a nuclear enzyme involved in DNA repair. However, these agents have also proved to have antitumor activity in breast cancer cells. BRCA1- and BRCA2-deficient cell lines are defective in homologous recombination, thus relying on PARP-1 for DNA repair. BRCA-deficient cells treated with PARP inhibitors demonstrate an increase in DNA fragmentation and cell death. Cyclin-depdenent kinases (CDK) 4/6 control the shifting from the G1 to the S phase in the cell cycle, and they are known to be overactive and not regulated. In estrogen-receptor positive breast cancer, CDK4 seems to heavily influence cell proliferation, and so this has become a useful target for drug development. In March 2017, the FDA approved both palbociclib (Ibrance) and ribociclib (Kisqali) for the treatment of hormone receptor (HR) positive, HER2-negative advanced or metastatic breast cancer in combination with an aromatase inhibitor as initial endocrine-based therapy in postmenopausal women. Cardoso F, van't Veer LJ, Bogaerts J, et al, MINDACT Investigators. 70-Gene Signature as an Aid to Treatment Decisions in Early-Stage Breast Cancer. N Engl J Med. 2016 Aug 25. 375 (8):717-29. [Medline]. King TA, Gurevich I, Sakr R, et al. Occult malignancy in patients undergoing contralateral prophylactic mastectomy. Ann Surg. 2011 Jul. 254(1):2-7. [Medline]. [Guideline] Denduluri N, Somerfield MR, Eisen A, Holloway JN, Hurria A, King TA, et al. Selection of Optimal Adjuvant Chemotherapy Regimens for Human Epidermal Growth Factor Receptor 2 (HER2) -Negative and Adjuvant Targeted Therapy for HER2-Positive Breast Cancers: An American Society of Clinical Oncology Guideline Adaptation of the Cancer Care Ontario Clinical Practice Guideline. J Clin Oncol. 2016 Jul 10. 34 (20):2416-27. [Medline]. [Full Text]. Martin M, Pienkowski T, Mackey J, Pawlicki M, Guastalla JP, Weaver C, et al. Adjuvant docetaxel for node-positive breast cancer. N Engl J Med. 2005 Jun 2. 352(22):2302-13. [Medline]. Martín M, Seguí MA, Antón A, Ruiz A, Ramos M, Adrover E, et al. Adjuvant docetaxel for high-risk, node-negative breast cancer. N Engl J Med. 2010 Dec 2. 363(23):2200-10. [Medline]. Citron ML, Berry DA, Cirrincione C, Hudis C, Winer EP, Gradishar WJ, et al. Randomized trial of dose-dense versus conventionally scheduled and sequential versus concurrent combination chemotherapy as postoperative adjuvant treatment of node-positive primary breast cancer: first report of Intergroup Trial C9741/Cancer and Leukemia Group B Trial 9741. J Clin Oncol. 2003 Apr 15. 21(8):1431-9. [Medline]. Romond EH, Perez EA, Bryant J, Suman VJ, Geyer CE Jr, Davidson NE, et al. Trastuzumab plus adjuvant chemotherapy for operable HER2-positive breast cancer. N Engl J Med. 2005 Oct 20. 353(16):1673-84. [Medline]. Coombes RC, Bliss JM, Wils J, Morvan F, Espié M, Amadori D, et al. Adjuvant cyclophosphamide, methotrexate, and fluorouracil versus fluorouracil, epirubicin, and cyclophosphamide chemotherapy in premenopausal women with axillary node-positive operable breast cancer: results of a randomized trial. The International Collaborative Cancer Group. J Clin Oncol. 1996 Jan. 14(1):35-45. [Medline]. Martin M, Villar A, Sole-Calvo A, Gonzalez R, Massuti B, Lizon J, et al. Doxorubicin in combination with fluorouracil and cyclophosphamide (i.v. FAC regimen, day 1, 21) versus methotrexate in combination with fluorouracil and cyclophosphamide (i.v. CMF regimen, day 1, 21) as adjuvant chemotherapy for operable breast cancer: a study by the GEICAM group. Ann Oncol. 2003 Jun. 14(6):833-42. [Medline]. Aisner J, Weinberg V, Perloff M, Weiss R, Perry M, Korzun A, et al. Chemotherapy versus chemoimmunotherapy (CAF v CAFVP v CMF each +/- MER) for metastatic carcinoma of the breast: a CALGB study. Cancer and Leukemia Group B. J Clin Oncol. 1987 Oct. 5(10):1523-33. [Medline]. Bonadonna G, Brusamolino E, Valagussa P, Rossi A, Brugnatelli L, Brambilla C, et al. Combination chemotherapy as an adjuvant treatment in operable breast cancer. N Engl J Med. 1976 Feb 19. 294(8):405-10. [Medline]. Budd GT, Green S, O'Bryan RM, Martino S, Abeloff MD, Rinehart JJ, et al. Short-course FAC-M versus 1 year of CMFVP in node-positive, hormone receptor-negative breast cancer: an intergroup study. J Clin Oncol. 1995 Apr. 13(4):831-9. [Medline]. Jones SE, Savin MA, Holmes FA, O'Shaughnessy JA, Blum JL, Vukelja S, et al. Phase III trial comparing doxorubicin plus cyclophosphamide with docetaxel plus cyclophosphamide as adjuvant therapy for operable breast cancer. J Clin Oncol. 2006 Dec 1. 24(34):5381-7. [Medline]. Helwick C. Final Analysis of BCIRG-006 Supports Use of Non–Anthracycline-Containing Regimen in Treatment of Women With Early Breast Cancer. The ASCO Post. Available at http://www.ascopost.com/issues/march-10-2016/final-analysis-of-bcirg-006-supports-use-of-nonanthracycline-containing-regimen-in-treatment-of-women-with-early-breast-cancer/. March 10, 2016; Accessed: August 4, 2017. Wood WC, Budman DR, Korzun AH, Cooper MR, Younger J, Hart RD, et al. Dose and dose intensity of adjuvant chemotherapy for stage II, node-positive breast carcinoma. N Engl J Med. 1994 May 5. 330(18):1253-9. [Medline]. Sartor CI, Peterson BL, Woolf S, Fitzgerald TJ, Laurie F, Turrisi AJ, et al. Effect of addition of adjuvant paclitaxel on radiotherapy delivery and locoregional control of node-positive breast cancer: cancer and leukemia group B 9344. J Clin Oncol. 2005 Jan 1. 23(1):30-40. Epub 2004 Nov 15. Coleman R, Cameron D, Dodwell D, Bell R, Wilson C, Rathbone E, et al. Adjuvant zoledronic acid in patients with early breast cancer: final efficacy analysis of the AZURE (BIG 01/04) randomised open-label phase 3 trial. Lancet Oncol. 2014 Aug. 15 (9):997-1006. [Medline]. Ferguson T, Wilcken N, Vagg R, Ghersi D, Nowak AK. Taxanes for adjuvant treatment of early breast cancer. Cochrane Database Syst Rev. 2007 Oct 17. CD004421. [Medline]. Berry DA, Thor AD, Jewell SD, et al. Benefits of adding paclitaxel to adjuvant doxorubicin/cyclophosphamide depending on HER2 & ER status: analysis of tumor tissue microarrays and immunohistochemistry in CALGB 9344 (Intergroup 0148). [Abstract] 32nd Annual San Antonio Breast Cancer Symposium, December 9-13, 2009, San Antonio, Texas. A-606, 2009. Burnell M, Levine MN, Chapman JA, Bramwell V, Gelmon K, Walley B, et al. Cyclophosphamide, epirubicin, and Fluorouracil versus dose-dense epirubicin and cyclophosphamide followed by Paclitaxel versus Doxorubicin and cyclophosphamide followed by Paclitaxel in node-positive or high-risk node-negative breast cancer. J Clin Oncol. 2010 Jan 1. 28(1):77-82. [Medline]. [Full Text]. Ellis P, Barrett-Lee P, Johnson L, Cameron D, Wardley A, O'Reilly S, et al. Sequential docetaxel as adjuvant chemotherapy for early breast cancer (TACT): an open-label, phase III, randomised controlled trial. Lancet. 2009 May 16. 373(9676):1681-92. [Medline]. [Full Text]. Sparano JA, Wang M, Martino S, Jones V, Perez EA, Saphner T, et al. Phase III study of doxorubicin-cyclophosphamide followed by paclitaxel or docetaxel given every 3 weeks or weekly in operable breast cancer: Results of Intergroup Trial E1199. Journal of Clinical Oncology, 2007 ASCO Annual Meeting Proceedings (Post-Meeting Edition). Vol 25, No 18S (June 20 Supplement), 2007:516. [Full Text]. Jones SE, Erban J, Overmoyer B, Budd GT, Hutchins L, Lower E, et al. Randomized phase III study of docetaxel compared with paclitaxel in metastatic breast cancer. J Clin Oncol. 2005 Aug 20. 23(24):5542-51. [Medline]. Jones S, Holmes FA, O'Shaughnessy J, Blum JL, Vukelja SJ, McIntyre KJ, et al. Docetaxel With Cyclophosphamide Is Associated With an Overall Survival Benefit Compared With Doxorubicin and Cyclophosphamide: 7-Year Follow-Up of US Oncology Research Trial 9735. J Clin Oncol. 2009 Mar 10. 27(8):1177-83. [Medline]. Gennari A, Sormani MP, Pronzato P, Puntoni M, Colozza M, Pfeffer U, et al. HER2 status and efficacy of adjuvant anthracyclines in early breast cancer: a pooled analysis of randomized trials. J Natl Cancer Inst. 2008 Jan 2. 100(1):14-20. [Medline]. Watanabe T, Sano M, Takashima S, Kitaya T, Tokuda Y, Yoshimoto M, et al. Oral uracil and tegafur compared with classic cyclophosphamide, methotrexate, fluorouracil as postoperative chemotherapy in patients with node-negative, high-risk breast cancer: National Surgical Adjuvant Study for Breast Cancer 01 Trial. J Clin Oncol. Mar 20 2009. 27(9):1368-74. Paridaens RJ, Dirix LY, Beex LV, Nooij M, Cameron DA, Cufer T, et al. Phase III study comparing exemestane with tamoxifen as first-line hormonal treatment of metastatic breast cancer in postmenopausal women: the European Organisation for Research and Treatment of Cancer Breast Cancer Cooperative Group. J Clin Oncol. Oct 20 2008. 26(30):4883-90. Nielsen KV, Ejlertsen B, Muller S, et al. Amplification of ESR1 may predict resistance to adjuvant tamoxifen in postmenopausal patients with hormone receptor positive breast cancer. Breast Cancer Res Treat. 2011 Jun. 127(2):345-55. [Medline]. Brooks M. Tamoxifen for 10 Years an Option: ASCO Guideline Update. Medscape Medical News. Available at http://www.medscape.com/viewarticle/825727. Accessed: June 2, 2014. [Guideline] Burstein HJ, Temin S, Anderson H, Buchholz TA, Davidson NE, Gelmon KE, et al. Adjuvant Endocrine Therapy for Women With Hormone Receptor-Positive Breast Cancer: American Society of Clinical Oncology Clinical Practice Guideline Focused Update. J Clin Oncol. 2014 May 27. [Medline]. Davies C, Godwin J, Gray R, et al. Relevance of breast cancer hormone receptors and other factors to the efficacy of adjuvant tamoxifen: patient-level meta-analysis of randomised trials. Lancet. 2011 Aug 27. 378(9793):771-84. [Medline]. [Full Text]. Early Breast Cancer Trialists' Collaborative Group (EBCTCG). Effects of chemotherapy and hormonal therapy for early breast cancer on recurrence and 15-year survival: an overview of the randomised trials. Lancet. 2005 May 14-20. 365(9472):1687-717. [Medline]. Varga Z, Cserhati A, Kelemen G, et al. Role of systemic therapy in the development of lung sequelae after conformal radiotherapy in breast cancer patients. Int J Radiat Oncol Biol Phys. 2011 Jul 15. 80(4):1109-16. [Medline]. Tang G, Shak S, Paik S, et al. Comparison of the prognostic and predictive utilities of the 21-gene Recurrence Score assay and Adjuvant! for women with node-negative, ER-positive breast cancer: results from NSABP B-14 and NSABP B-20. Breast Cancer Res Treat. 2011 May. 127(1):133-42. [Medline]. Aubert RE, Stanek EJ, Yao J, Teagarden JR, Subar M Epstein RS, et al. Risk of breast cancer recurrence in women initiating tamoxifen with CYP2D6 inhibitors. J Clin Oncol. (Suppl; abstr CRA508) 2009. 27:18s. [Full Text]. Dezentje V, Van Blijderveen NJ, Gelderblom H, Putter H, Van Herk-Sukel MP, Casparie MK, et al. Concomitant CYP2D6 inhibitor use and tamoxifen adherence in early-stage breast cancer: A pharmacoepidemiologic study. J Clin Oncol. (suppl; abstr CRA509) 2009. 27:18s. [Full Text]. Chustecka Z. ASCO 2009: Avoid SSRIs in breast cancer patients on tamoxifen. Medscape Medical News. Jun 2, 2009. [Full Text]. Donneyong MM, Bykov K, Bosco-Levy P, Dong YH, Levin R, Gagne JJ. Risk of mortality with concomitant use of tamoxifen and selective serotonin reuptake inhibitors: multi-database cohort study. BMJ. 2016 Sep 30. 354:i5014. [Medline]. [Full Text]. Thürlimann B, Keshaviah A, Coates AS, Mouridsen H, Mauriac L, Forbes JF, et al. A comparison of letrozole and tamoxifen in postmenopausal women with early breast cancer. N Engl J Med. 2005 Dec 29. 353(26):2747-57. [Medline]. Forbes JF, Cuzick J, Buzdar A, Howell A, Tobias JS, Baum M. Effect of anastrozole and tamoxifen as adjuvant treatment for early-stage breast cancer: 100-month analysis of the ATAC trial. Lancet Oncol. 2008 Jan. 9(1):45-53. [Medline]. Goss PE, Ingle JN, Martino S, Robert NJ, Muss HB, Piccart MJ, et al. A randomized trial of letrozole in postmenopausal women after five years of tamoxifen therapy for early-stage breast cancer. N Engl J Med. 2003 Nov 6. 349(19):1793-802. [Medline]. Goss PE, Ingle JN, Pritchard KI, Robert NJ, Muss H, Gralow J, et al. Extending Aromatase-Inhibitor Adjuvant Therapy to 10 Years. N Engl J Med. 2016 Jul 21. 375 (3):209-19. [Medline]. Mouridsen H, Giobbie-Hurder A, Goldhirsch A, Thürlimann B, Paridaens R, Smith I, et al. Letrozole therapy alone or in sequence with tamoxifen in women with breast cancer. N Engl J Med. Aug 20 2009. 361(8):766-76. Early Breast Cancer Trialists' Collaborative Group (EBCTCG). Aromatase inhibitors versus tamoxifen in early breast cancer: patient-level meta-analysis of the randomised trials. Lancet. 2015 Jul 23. [Medline]. [Full Text]. Rastogi P, Anderson SJ, Bear HD, Geyer CE, Kahlenberg MS, Robidoux A, et al. Preoperative chemotherapy: updates of National Surgical Adjuvant Breast and Bowel Project Protocols B-18 and B-27. J Clin Oncol. 2008 Feb 10. 26(5):778-85. [Medline]. Slamon D, Eiermann W, Robert N, et al. Adjuvant trastuzumab in HER2-positive breast cancer. N Engl J Med. 2011 Oct 6. 365(14):1273-83. [Medline]. Baselga J, Cortés J, Kim SB, Im SA, Hegg R, Im YH, et al. Pertuzumab plus trastuzumab plus docetaxel for metastatic breast cancer. N Engl J Med. 2012 Jan 12. 366(2):109-19. [Medline]. Mulcahy N. FDA Approves First Drug for Neoadjuvant Breast Cancer Use. Medscape Medical News. Oct 2 2013. Available at http://www.medscape.com/viewarticle/811873. Accessed: October 8, 2013. Gianni L, Pienkowski T, Im YH, Roman L, Tseng LM, Liu MC, et al. Efficacy and safety of neoadjuvant pertuzumab and trastuzumab in women with locally advanced, inflammatory, or early HER2-positive breast cancer (NeoSphere): a randomised multicentre, open-label, phase 2 trial. Lancet Oncol. 2012 Jan. 13(1):25-32. [Medline]. Fitzal F, Riedl O, Mittlbock M, et al. Oncologic safety of breast conserving surgery after tumour downsizing by neoadjuvant therapy: a retrospective single centre cohort study. Breast Cancer Res Treat. 2011 May. 127(1):121-8. [Medline]. Jacobs MA, Ouwerkerk R, Wolff AC, et al. Monitoring of neoadjuvant chemotherapy using multiparametric, (23)Na sodium MR, and multimodality (PET/CT/MRI) imaging in locally advanced breast cancer. Breast Cancer Res Treat. 2011 Jul. 128(1):119-26. [Medline]. Burstein HJ, Elias AD, Rugo HS, Cobleigh MA, Wolff AC, Eisenberg PD, et al. Phase II study of sunitinib malate, an oral multitargeted tyrosine kinase inhibitor, in patients with metastatic breast cancer previously treated with an anthracycline and a taxane. J Clin Oncol. 2008 Apr 10. 26(11):1810-6. [Medline]. Taylor SK, Chia S, Dent S, Clemons M, Agulnik M, Grenci P, et al. A phase II study of pazopanib in patients with recurrent or metastatic invasive breast carcinoma: a trial of the Princess Margaret Hospital phase II consortium. Oncologist. 2010. 15(8):810-8. [Medline]. Neratinib (Nerlynx) [package insert]. 10880 Wilshire Blvd., Suite 2150 Los Angeles, CA 90024-4106: Puma Biotechnology, Inc. 7/2017. Available at [Full Text]. Chan A, Delaloge S, Holmes FA, Moy B, Iwata H, Harvey VJ, et al. Neratinib after trastuzumab-based adjuvant therapy in patients with HER2-positive breast cancer (ExteNET): a multicentre, randomised, double-blind, placebo-controlled, phase 3 trial. Lancet Oncol. 2016 Mar. 17 (3):367-77. [Medline]. [Full Text]. Baselga J, Semiglazov V, van Dam P, Manikhas A, Bellet M, Mayordomo J, et al. Phase II randomized study of neoadjuvant everolimus plus letrozole compared with placebo plus letrozole in patients with estrogen receptor-positive breast cancer. J Clin Oncol. Jun 1 2009. 27(16):2630-7. Baselga J, Campone M, Piccart M, Burris HA 3rd, Rugo HS, Sahmoud T, et al. Everolimus in postmenopausal hormone-receptor-positive advanced breast cancer. N Engl J Med. 2012 Feb 9. 366(6):520-9. [Medline]. Modi S, Stopeck A, Linden H, Solit D, Chandarlapaty S, Rosen N, et al. HSP90 inhibition is effective in breast cancer: a phase II trial of tanespimycin (17-AAG) plus trastuzumab in patients with HER2-positive metastatic breast cancer progressing on trastuzumab. Clin Cancer Res. 2011 Aug 1. 17 (15):5132-9. [Medline]. [Full Text]. Modi S, Saura C, Henderson C, Lin NU, Mahtani R, Goddard J, et al. A multicenter trial evaluating retaspimycin HCL (IPI-504) plus trastuzumab in patients with advanced or metastatic HER2-positive breast cancer. Breast Cancer Res Treat. 2013 May. 139 (1):107-13. [Medline]. [Full Text]. FDA approves first treatment for breast cancer with a certain inherited genetic mutation. U.S. Food & Drug Administration. Available at https://www.fda.gov/NewsEvents/Newsroom/PressAnnouncements/ucm592347.htm. January 12, 2018; Accessed: January 22, 2018. Robson M, Im SA, Senkus E, Xu B, Domchek SM, Masuda N, et al. Olaparib for Metastatic Breast Cancer in Patients with a Germline BRCA Mutation. N Engl J Med. 2017 Aug 10. 377 (6):523-533. [Medline]. Mayer EL, Demichele, Pfeiler G, Barry W, Metzger O, et al. PALLAS: PALbociclib CoLlaborative adjuvant study: A randomized phase 3 trial of palbociclib with standard adjuvant endocrine therapy versus standard adjuvant endocrine therapy alone for HR+/HER2- early breast cancer. Annals of Oncology. 18 September 2017. 28:[Full Text]. Geyer CE, Forster J, Lindquist D, et al. Lapatinib plus capecitabine for HER2-positive advanced breast cancer. N Engl J Med. Dec 28 2006. 355(26):2733-43. Mehta RS, Barlow WE, Albain KS, Vandenberg TA, Dakhil SR, Tirumali NR, et al. Combination anastrozole and fulvestrant in metastatic breast cancer. N Engl J Med. 2012 Aug 2. 367(5):435-44. [Medline]. Miller K, Wang M, Gralow J, et al. Paclitaxel plus bevacizumab versus paclitaxel alone for metastatic breast cancer. N Engl J Med. Dec 27 2007. 357(26):2666-76. US Food and Drug Administration. FDA begins process to remove breast cancer indication from Avastin label. Available at http://www.fda.gov/NewsEvents/Newsroom/PressAnnouncements/ucm237172.htm. Accessed: December 17, 2010.